We often see our elected officials squabbling on cable news shows, eagerly going at each other and speaking out of turn, without any discernible progress made from the debate. Thankfully, though, lawmakers do occasionally cooperate to solve problems and legislate. They are able to tame their passions in many ways,and one of the most important of these is by observing proper parliamentary procedures. Parliamentary procedures are a set of rules governing the order of debate, how bills are voted on, decorum in the legislature, and the like. Additionally, the rules are communicated with a highly specialized vocabulary,which might be intelligible to those who use it, but which also might seem archaic and overly formal to outsiders. The parliamentary procedures that govern our lawmakers’ debates are complicated and can be confusing—especiallyfor Members of Congress, much less private citizens, and even their staff. 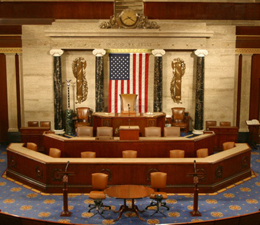 To help both legislative officials and constituents understand more about parliamentary procedure, the Congressional Institute has made available the U.S. House of Representatives Floor Procedures Manual. This publication is a handy guideto deliberations that take place on the Floor of the U.S. House of Representatives. It explains the daily business of the House, the process for debating and amending a bill following a report by a committee, standards of decorum and much more. A glossary of congressional terms is included as well.It has been revised by the House Rules Committee to ensure that it reflects changes made to the House Rules adopted at the beginning of the 112thCongress. A digital version of the Floor Procedures Manual is now available on the Congressional Institute’swebsite. The online Manual includesall the original material, plus links to various supplemental sources, making it a more powerful tool for learning about the inner workings of the legislature.